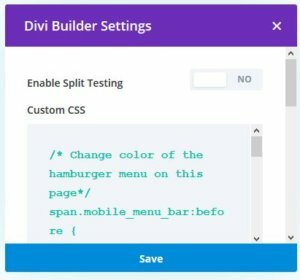 Do you want to change the color of the hamburger icon on your mobile menu and tablet for your DIVI website.? Add the following CSS snippet to your DIVI theme and change the color to match your website colors. You can add the CSS either to your style.css in your child theme OR go to the DIVI- Theme Options on your dashboard. In the General Tab, scroll down to the “Custom CSS” text area. I have set it to a shade of yellow (#d9b310) in the example below, to match my website colors. Replace the (#d9b310) in the code to the color of your choice to match the branding of your website. Here is what it looks like when viewing my site on mobile. You can also tweak the color of the hamburger or mobile icon only on a specific page in DIVI. I use this trick sometimes if my hamburger icon is not contrasting well with a background slider image. This will override the previous hamburger menu color (if you did set one in the style.css), but only on this specific page. Open a page in your WordPress dashboard in DIVI. Click on the Page settings as shown below. Copy the same CSS as shown above in the Custom CSS box. Click on Save and Update your page. Related Post : Change the color of the top border mobile menu in DIVI. I would love to hear about how I can help your business website. I have specialized in using the DIVI theme from Elegant Themes since the past four years. If you would like to see the projects that I have completed as a DIVI freelancer, please do have a look at my portfolio. Please contact me and I will get back to you immediately.